Tracy Ngo, DDS (General Dentistry) is based out of Santa Clara, CA. 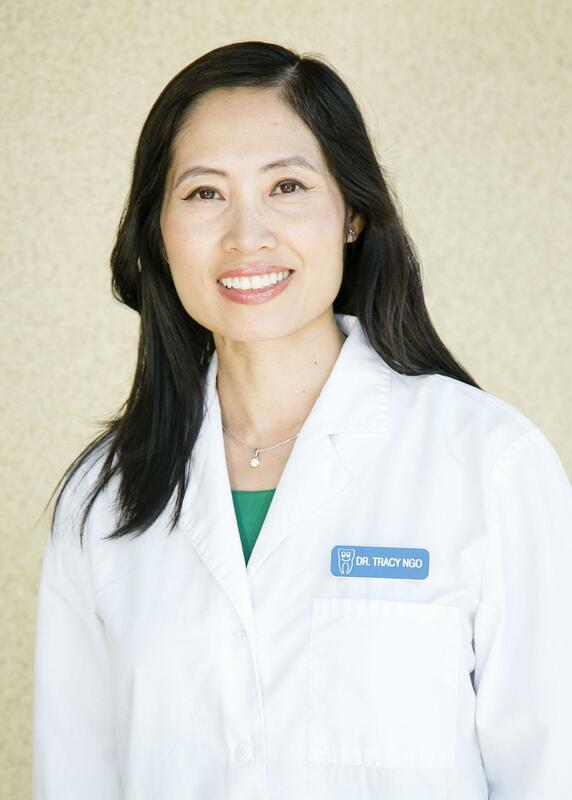 Tracy Ngo values your feedback and has received 11 reviews with an average rating of 5.0 from patients. Click on the Post Review button to share your comments. Dr.Tracy and the staff are very friendly and they always do a great job taking care of my oral health with the best treatment and advises! The Saturday appointments are very convenient. They also make sure to remind you of your appointment a week before and also again on a day before so you don't miss it! Kudos to the entire team work!! I had been with my same dentist for over 30 years and a few years ago, I decided to give Dr. Ngo a try as I had lot of dental work needing done. I was told about her through a close friend of mine, as I am very cautious about going to new places. I must say that I was 100% happy with the work she conducted on my first visit and went back several more time over the past few years to get some major work done. I was cautious at first because I didn't want unnecessary work being done at my expense. To my surprise Dr. Ngo is very honest and told me on a couple occasions that certain work did not need to be conducted. I love honesty and great work and got both from this office. I must also say that Dr. Ngo has a very friendly and professional staff at the office as well and the same ladies have been there all the years I've been going there. To top off all the good work, they are all beautiful ladies and nice on the eyes ;-)I would strongly recommend this office to anyone who needs mild to heavy dental work done. I did three fillings there. They seem fine. But it is just 2 days. So I cannot be confidentI give her 5 star because she is a dentist you can trust. You have to trust a dentist. Otherwise you might get extra work done.Her price was also better than another doctor that I checked. I have insurance. I had good experience in her office. Dr. Ngo is off the charts! Awesome dentist and very friendly. She will go out of her way to help you! She did an amazing job of taking care of all my cavities in one seating which I know no other dentist would ever even attempt! She even went out of her way to ensure that I was properly numb before drilling! I have had many difficult issues with my teeth. Tracy has worked miracles for me and saved me a lot of money. I travel from Los Altos for my appointments and could not be more satisfied. Dr. Ngo is one of the best dentists I have ever been to. I've been going to her since 2009 and I have been going back ever since. She is very nice and she makes the experience very relaxing. I recommend her to all without a doubt. I have been going here for about two years; super convenient location, as its basically down the block from my apartment. Dr. Ngo is a straightforward dentist and she checks in with me during the cleaning to make sure I am doing okay. I was embarrassed about an ugly area on one of my front teeth but she smoothed it over and made it look much better. She provides constructive feedback on taking care of teeth and is very easy to talk to. I also enjoy working with the receptionist, Marisela. She explains things clearly and is happy and positive. She also speaks with me in Spanish, which is really cool so I can practice. I have referred my sister to this place and she has also had a positive experience so far. Note: I think the name of this business on Yelp should be changed to "Stevens Creek Family Dentistry" as that is the actual name it operates with. I suspect that with this change, more of the patients would be able to find and review this on yelp. Dr. Ngo is a great dentist! I've been to a lot of dentists and I've never trusted one as much as I trust Dr. Ngo. She gives it to you straight and at extremely affordable prices. She does her job extremely well and she made me feel very comfortable. I rarely post reviews on Yelp, but Dr. Ngo is just THAT good. She's one of the best dentists I've ever been to! She really cares about your treatment and makes you feel very comfortable. Also love the decor of her place. Dr. Ngo has great bedside manners and I've only received the best dental work from her.